Advantage Africa is a registered charity (no. 1092719) with an office in Olney’s Market Place above Taylor’s Estate Agents. The organisation was founded in 2002 on the values of justice, equality and opportunity for Africa’s poorest and most excluded people. 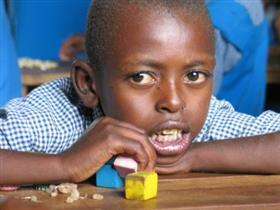 Advantage Africa supports people affected by poverty, disability and HIV to improve their education, health and incomes. Their work helps some of East Africa’s most vulnerable people to overcome prejudice, help themselves and build a better future for their families and communities. Advantage Africa is helping disabled children to attend school for the first time, people living with HIV to access life-saving medicines, single-parent families to earn an income to meet their basic needs and children with albinism to be protected from skin cancer.